Both presidents are among leaders gathering for the Association of Southeast Asian Nations (Asean) summit in Laos. Instead Mr Duterte has had to spend his first day here saying “Sorry” on a global platform. 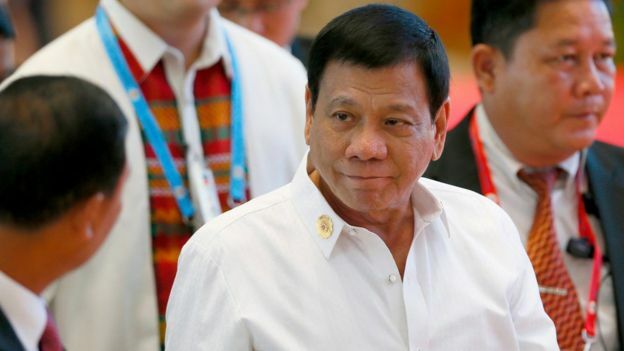 But speaking in Manila on Monday before he left for Laos, Mr Duterte bristled at the suggestion, saying it was “rude” and cursing the US president. He then referred to the anti-drugs campaign that has led to the killing of 2,400 suspected drug dealers and users in the Philippines since he took office in June. Mr Obama initially appeared to play down the insult saying that he had asked his aides to work out if this is “a time where we can have some constructive, productive conversations”. This is not the first time President Duterte has employed vitriolic language against such prominent figures. He has called Pope Francis the “son of a whore”, Secretary of State John Kerry “crazy” and recently referred to the US ambassador to the Philippines a “gay son of a whore” . Correspondents say that such colourful talk plays well with the domestic audience, but it could cost Mr Duterte on the international stage.